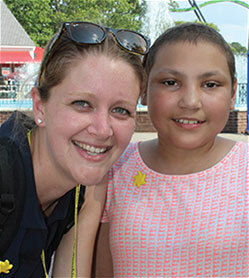 The Sunshine Kids Foundation staff, assisted by dedicated volunteers, organizes numerous events and activities annually that effect the lives of hundreds of young cancer patients and their families. They welcome your inquiries and comments as they strive to create more positive and exciting experiences for children fighting cancer. After serving as a SSK volunteer for fifteen years, G.W. Bailey became the Executive Director in 2001. 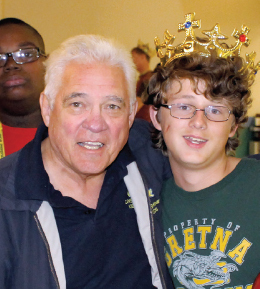 Since creating the California Fun-Time Fantasy in 1988, he has overseen the expansion of National Events that now include ten destinations and involving volunteers working nationwide with the Foundation to provide trips and activities for hundreds of young cancer patients annually. G.W. became internationally known as a professional actor for his portrayal as Capt. Harris in the Police Academy film series. He is also widely recognized as Sgt. Rizzo from the M*A*S*H television series and for his other feature and TV movies. He was a regular on the TNT television hit series The Closer and is currently on Major Crimes. G.W. was introduced to the Sunshine Kids by his goddaughter Brandy Aldridge who had been diagnosed with leukemia. 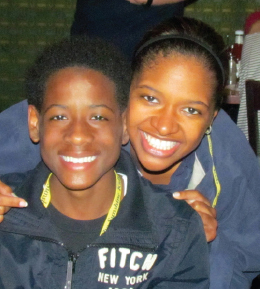 Her experiences with other Kids who were also fighting cancer had a profound effect on Brandy, her family and friends. She inspired G.W. to begin working with the Foundation and with Founder, Rhoda Tomasco, in an effort to create more activities that would reach as many Kids as possible. 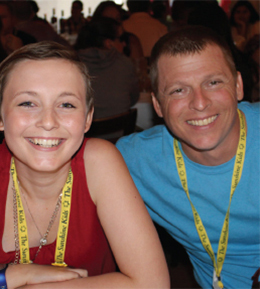 His work with the Sunshine Kids has always been dedicated to the memory of this remarkable young woman. Shannon Malone joined the Sunshine Kids Foundation in 1994. 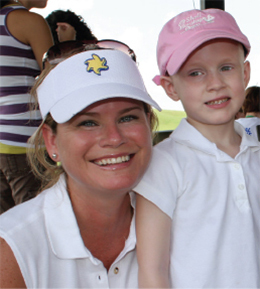 As Director of Operations she oversees the day to day operations for the Foundation. She is the corporate liaison for the Foundation's national sponsor, Berkshire Hathaway HomeServices, where she cultivates and maintains relationships with the affiliate offices and coordinates fundraising events across the United States. Malone received a Bachelor of Art degree in Psychology with a minor in Political Science from the University of Texas at Arlington. Jennifer Wisler joined the Sunshine Kids Foundation in 1998. As Director of Children's Services since 2000 she is responsible for all children's events. Her main focus is the organization of National Events and the coordination of attending hospitals and volunteers across the country. Wisler received a Bachelor of Science degree in Journalism with a minor in Political Science from Texas Christian University in Fort Worth, Texas. 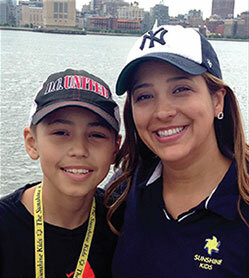 Rita Suchma joined the Sunshine Kids Foundation in January 2009 as Director of Development. She is responsible for managing the day to day fundraising operations including identifying and cultivating new funding sources, grant writing, stewardship and managing the annual fund. Suchma began her special relationship with the Sunshine Kids over 15 years ago while working with the Houston Astros Baseball Club. 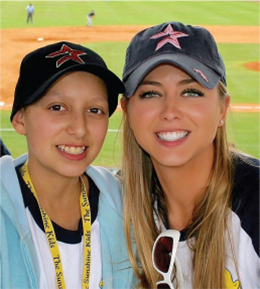 As the Astros' Director of Community Relations and Foundation Development, she served as liaison to The Sunshine Kids working with Craig and Patty Biggio on many of the Kids’ ballpark visits and holiday parties. She is a native Houstonian and attended the University of Houston – Downtown. Ben Buchert joined the Sunshine Kids Foundation in 2001. As Director of Media Services, he is responsible for producing and editing videos for the Foundation. Prior to working with the Sunshine Kids, Buchert worked as an editor and photographer for United States Army Combat Training, Access Houston and KLP Productions. Buchert received an Associate’s Degree in Video Production from The Art Institute of Houston. Edrian Brooks joined the Sunshine Kids Foundation in 2006 and worked in Children’s Services prior to her current position, as Associate Director of Operations. In this position, she manages the day to day operations of the Foundation and provides support to our National Sponsor. Brooks received her Bachelor of Arts Degree in Marketing/Management Information Systems from Dillard University in New Orleans, Louisiana. Shelby Shanks joined the Sunshine Kids Foundation in 2018. As Development Associate, she is responsible for the day to day fundraising, grant writing and gift management. 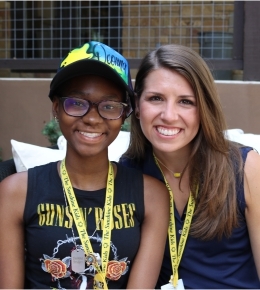 Prior to joining the Sunshine Kids, she interned for the United Way of Brazos Valley in their development department. Shanks received a Bachelor of Science Degree in Agricultural Communications and Journalism from Texas A&M University in College Station, Texas. Jenni Cash joined the Sunshine Kids Foundation in 2017 as Development Associate. She assists with the day-to-day fundraising, grant writing and gift management. 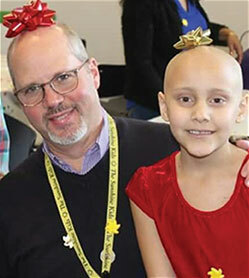 Prior to joining the Sunshine Kids, she worked as the Gift Records Coordinator for Baylor College of Medicine. Cash received a Bachelor of Arts in Sociology and a Minor in Health Education from Sam Houston State University in Huntsville, TX. 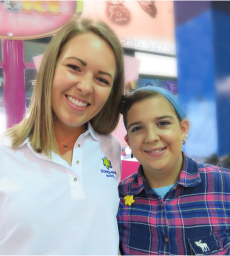 Kaitlyn Harper joined the Sunshine Kids Foundation in 2018. As Activities Coordinator, she is responsible for planning and coordinating regional and national events. Prior to joining Sunshine Kids Foundation, Kaitlyn worked as an operations coordinator at Faithbridge Church in Spring, Texas. Harper received a Bachelor of Science degree in Community Health from Texas A&M University as well as a graduate certificate in Nonprofit Management with an emphasis in Fundraising and Philanthropy. Brooks joined the Sunshine Kids Foundation in 2006. As Director of Regional Offices, he is responsible for overseeing the coordination and management of events, staff, and fundraising activities in the regional offices. Prior to working with the Sunshine Kids Foundation, Brooks had twenty-three years of experience in Hollywood in a variety of positions, mostly in set lighting. He worked as a department head on movies such as The Lost World, and TV series including Cold Case, American Dreams, and The Closer. Tomb received a Bachelor of Arts degree in English Literature from Columbia University in New York City. Courtney Bragg joined the Sunshine Kids Foundation in 2016. As Activities Coordinator, she is responsible for the planning and coordination of local events for the Eastern Region. Prior to working with The Sunshine Kids, she worked as a Special Education Paraprofessional. Bragg received a Bachelor of Science degree in Rehabilitation & Disability Studies from Springfield College in Springfield, MA. Natalie Neufeld Lewis, a thirty-year leukemia survivor, attended her first Sunshine Kids event at the 1988 Winter Games in Aspen, Colorado. As Associate Director of Regional Offices, she is responsible for overseeing the day to day operations and fundraising events for the Western Region office. She also serves as a spokesperson for The Sunshine Kids across the country. Natalie has over ten years’ experience in event planning, catering and convention services in the hotel industry. 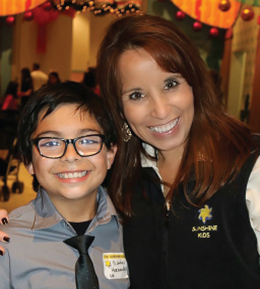 Since her diagnosis in 1982, she has participated in childhood cancer awareness and in fundraising events throughout her community. Lewis received a Bachelor’s Degree in Sociology from St. Mary’s University in San Antonio, Texas. 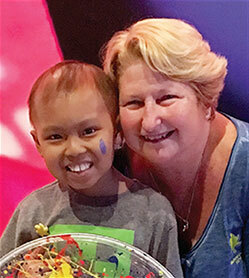 Janet Yon began volunteering with the Sunshine Kids in 2008 before joining the Foundation as Special Projects Coordinator for the Southeast Region in 2015. She is responsible for the planning and coordination of local and regional events, fundraising opportunities and building community relationships across the Southeast Region. Yon brings years of experience in marketing, fundraising and event planning. Andrea D’Andrea joined the Sunshine Kids Foundation in 2017. As Activities Coordinator, she is responsible for the planning and coordination of local events throughout the Southeast Region. Andrea brings years of experience working closely with children. Before beginning with The Sunshine Kids, she taught Elementary school and Preschool. Andrea holds a Bachelor of Science degree in Elementary Education from the University of South Florida in Tampa, FL. 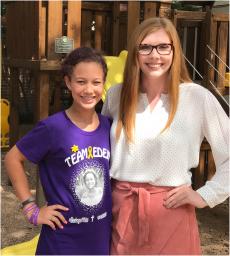 Madison Alger joined the Sunshine Kids Foundation in 2018. As Activities Coordinator, she is responsible for planning and coordinating local events in the Southeastern Region. Prior to joining the Sunshine Kids Foundation, Madison worked for a luxury development company doing marketing and events, with almost 8 years of experience in high-end event planning and coordination. Alger received a Bachelor of Science degree in Resort and Hospitality Management with a concentration in Event Management from Florida Gulf Coast University in Fort Myers, Florida.